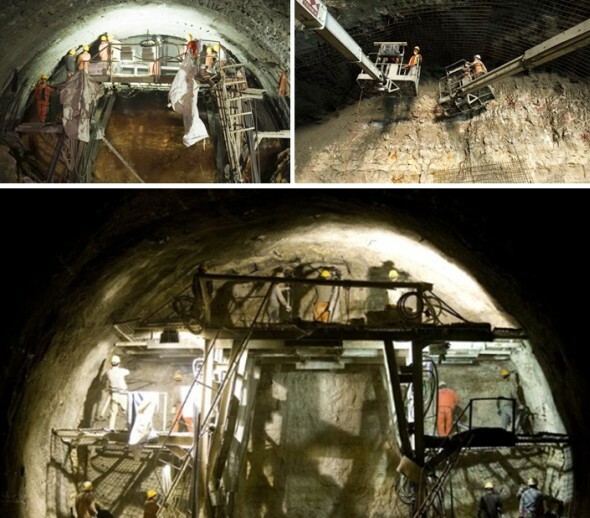 Haifa is about to join larger cities such as Tokyo, Paris and Stockholm where underground tunneling helps to reduce ever-growing urban traffic. Project franchisee, Carmelton, has completed digging the westbound tunnel in the eastern portion of the Carmel Tunnels project - a set of road tunnels currently being constructed inside Mt. Carmel - under and around the city of Haifa, Israel. Amazingly, the idea for the megalomaniac project was originally conceived over 100 years ago by the Turks during the rule of the Ottoman Empire. 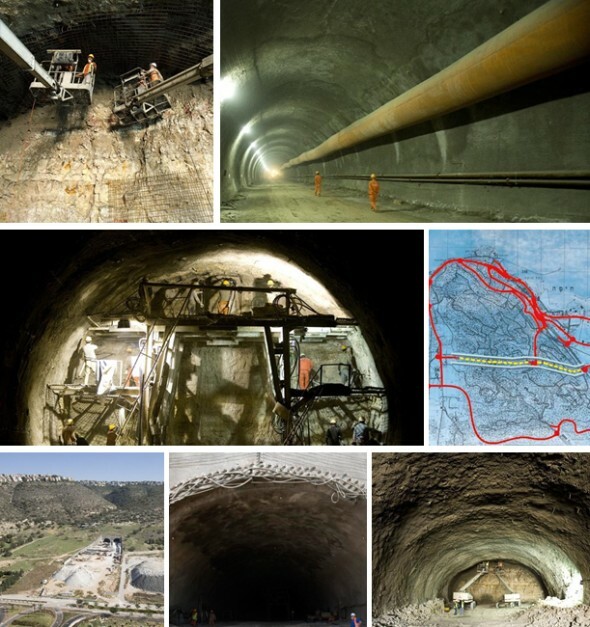 Today the Carmel Tunnels project is considered the second largest BOT project ever undertaken in the Middle East. 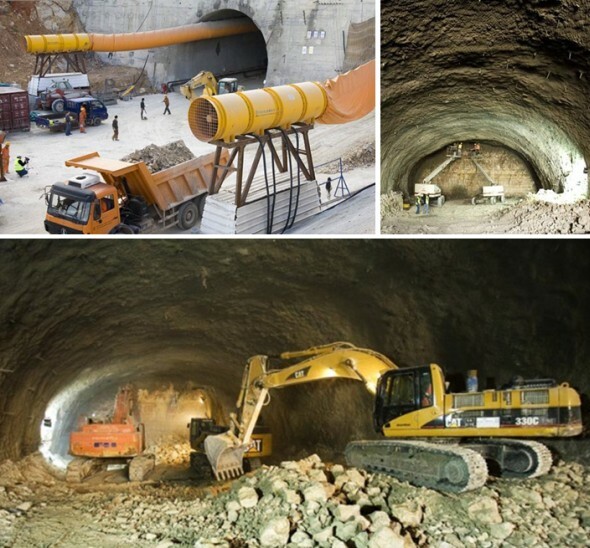 The tunnels will have three portals: one from the west, near the MATAM Advanced Technology business park, one in the center off Rupin Road and from the east leading to the Kerayot interchange also known as the "Checkpost". 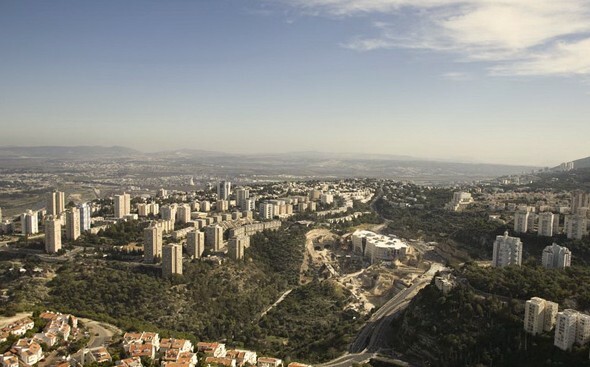 The project aims to connect Israel's Coastal Highway (Road 2) at the southern entrance of Haifa with the northern entrance, bypassing the city center. Bridges enter the eastern portal, leading to the Kerayot interchange. 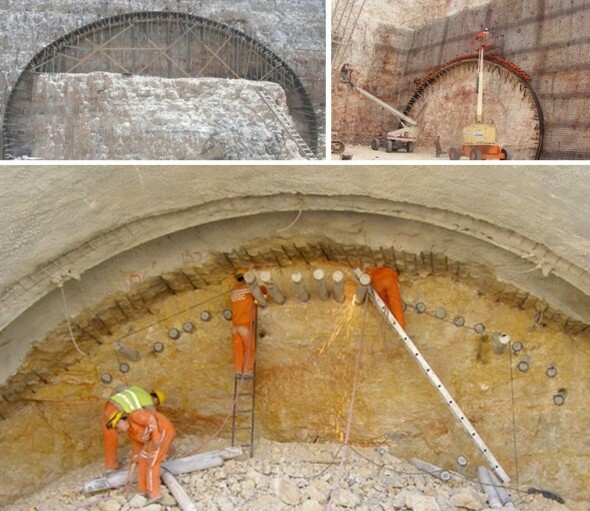 The completed 1,650-meter long westbound tunnel is the longest tunnel ever built in Israel and the most ambitious construction project of its kind ever preformed in Israel. 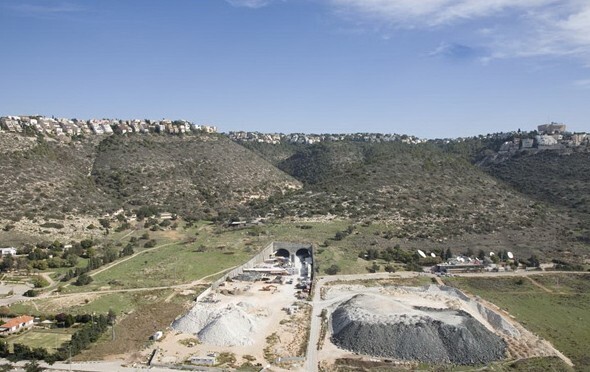 According to Israel's leading financial newspaper "Globes" this is "a historic date" as the link of the first tunnel is "an important milestone toward the opening of the tunnels to traffic within two years." The Carmel tunnels are built as a BOT (Build, operate, transfer) project so driving in the tunnels will require paying a toll. 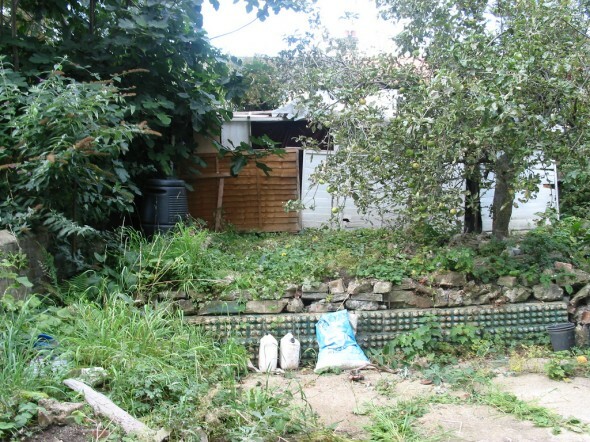 The project has already gone through many difficulties and was almost terminated more than once. Carmelton has already obtained financing for the project in 1999 but construction was delayed until 2002 due to objections and other legal matters. 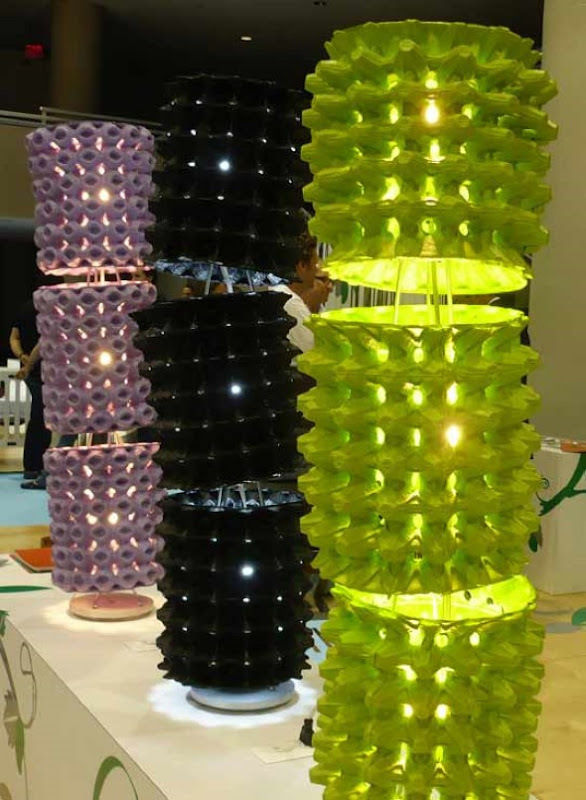 The project was once again delayed in September 2008 due to the International climbing constructions costs. 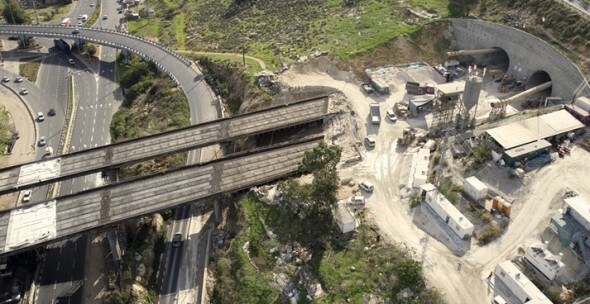 Eventually, the cost is estimated with 1.25 Billion NIS (approximately $300 million) including 4.7 kilometers of tunnels and 6.5 kilometers of routs altogether. 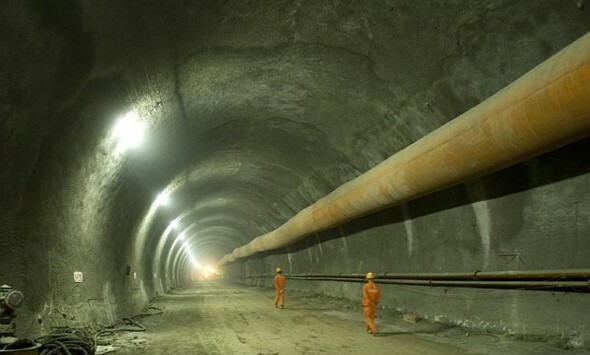 The tunnels are dug 100-200 meters under populated areas of Mt. 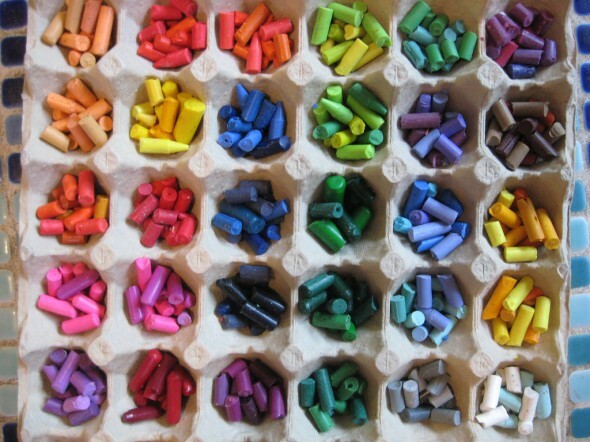 Carmel. Planning took 10 years from 1996 to 2006. Estimated total duration of implementation: 4 years. Here is an Interactive map of the Carmel Tunnels where you follow the tunnel path across the mountain. 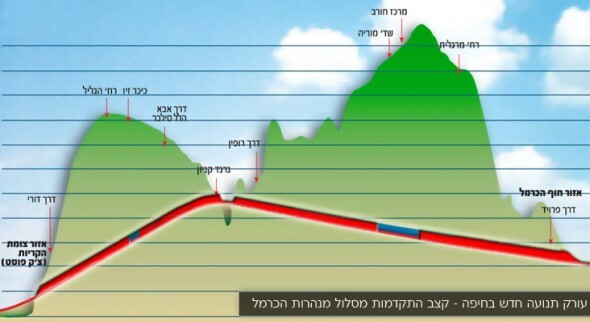 Below a sketched top-view map and side profile showing the tunnel rout through the mountain. The Mediterranean sea is on the left. 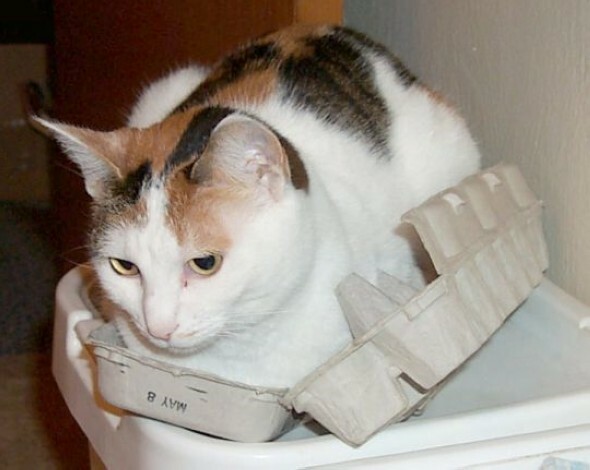 Did you know the egg carton was invented in 1911 in British Columbia in an attempt to solve a dispute between a farmer and a hotel owner who kept on blaming one another when the farmer's eggs often arrived broken? Probably not. 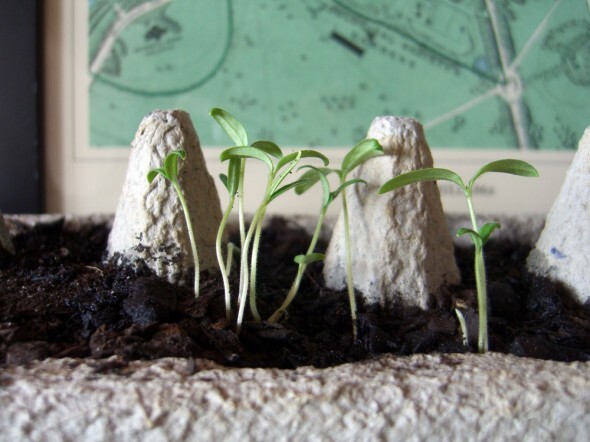 But approximately 100 years later, egg cartons are obvious items in almost every modern house and a significant portion of the trash we generate. 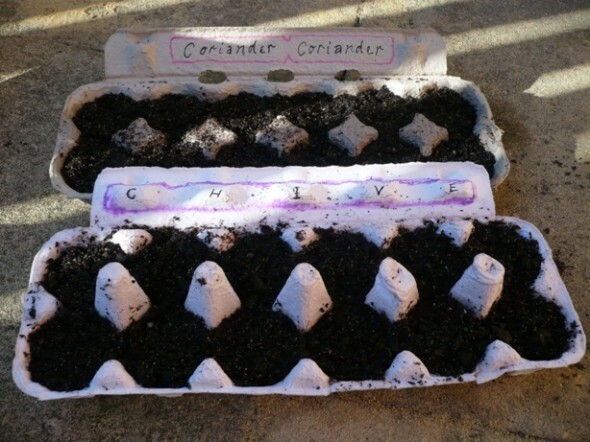 Yet, from modern art and high-class lighting sets to beds for cats, seed starters and toys - there are countless of ways egg cartons can be reused and otherwise useful. 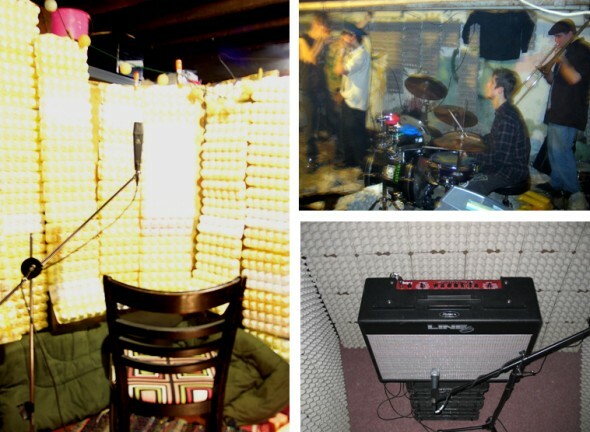 CultCase has photo-listed 20 of them here, but we know there are more. If you know of any others and have some photographs please do feel free to drop us a line anytime and we may publish them here. 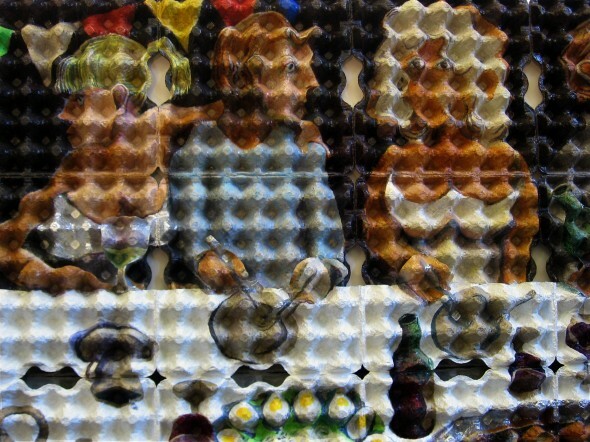 Completed in December 2008 and titled Village Party this new monumental masterpiece by Dutch artist Enno de Kroon is sized 154 x 209 x 24 cm and made of acrylic and egg cartons. 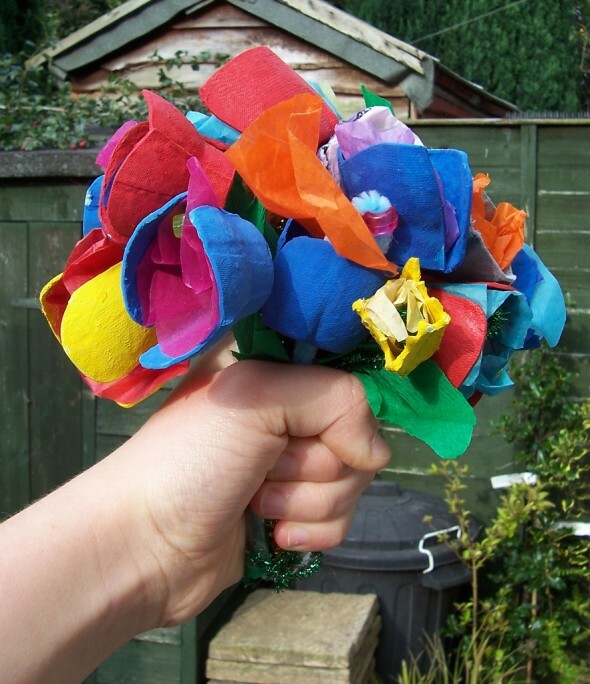 If you are a regular reader at CultCase you may have already stumbled The Art of Junk: 7 Creative Approaches to Trash Reuse and met De Kroon. From his studio at Rotterdam, The Netherlands, De Kroon leads a new wave in reuse art and helps taking cubism into the 21st century. 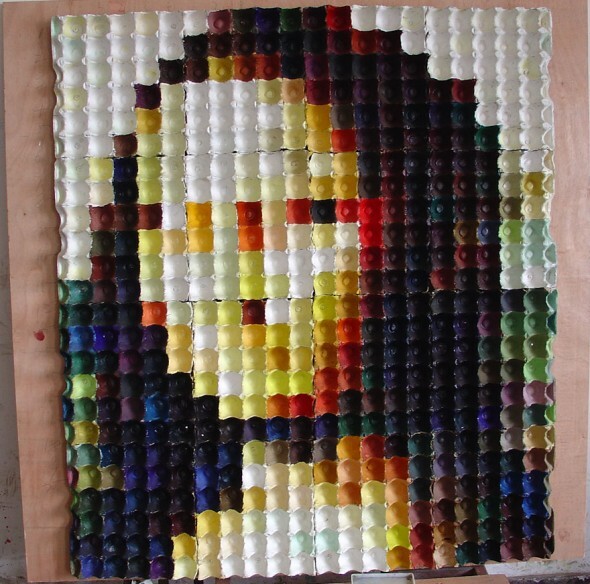 (Re)using ordinary egg crates for canvas De Kroon makes spectacular "two-and-a-half" dimensional paintings in a style he defines as Eggcubism. Above: A frontal view studio shot of Village Party. 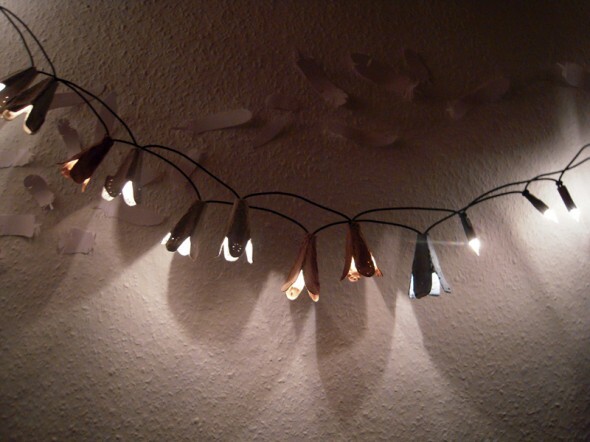 Below: details (cut by the artist). 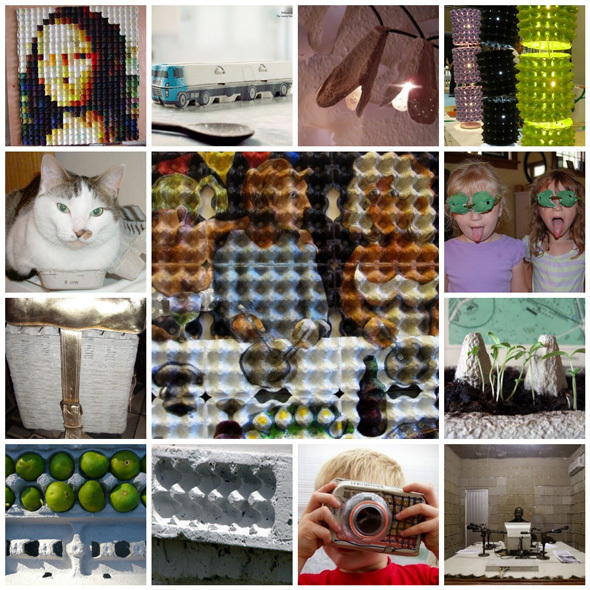 "The egg carton works came about out of my previous work where I find the relationship between the viewer and the piece as an object to be of great importance. I've always played with distortions of perspective, which puts the viewer on the wrong foot and makes them conscious of their manner of observing. The way we see things is so conditioned and decides what our minds eventually see in something. 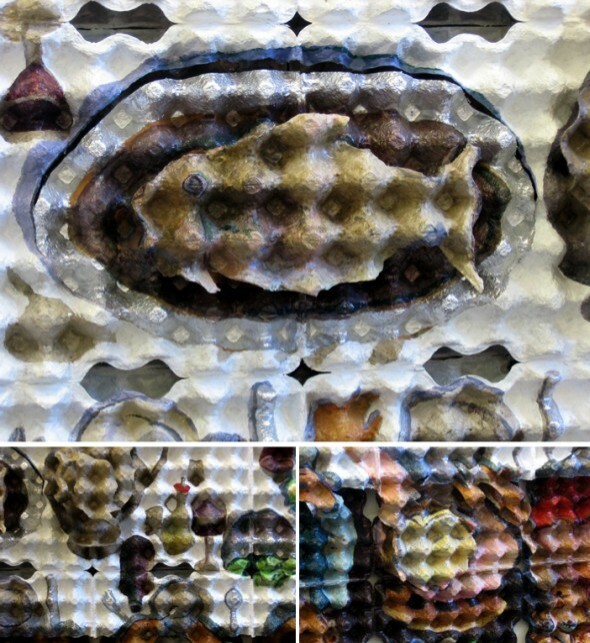 The egg cartons had been lying around my studio for some time ready for me to be painted upon, but it took some courage before I could take the plunge. 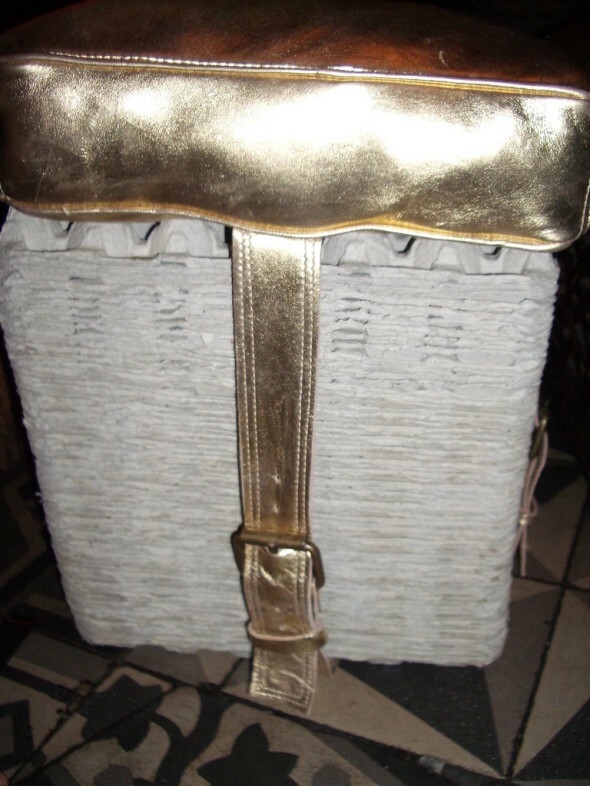 It also took a while to come up with a product I was satisfied with." No textual explanations had been made available about Village Party so far but, since we asked, De Kroon did provide us with a few words of clarifications about the inspirational roots of it. "Village Party was inspired by open air dinner parties that take place in the village streets of Provence in the south of France." Says De Kroon "it is a mixture of different perspectives one can have of such parties and the special social relations they involve. Someone has described my technique as "exploding" perspective. 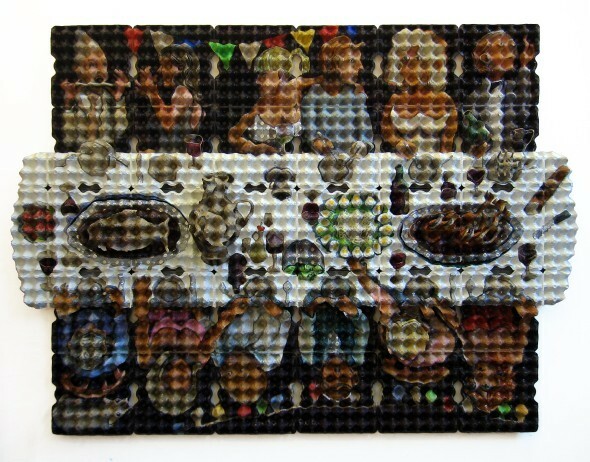 I don't know about that but they are related to Pieter Breugel works." 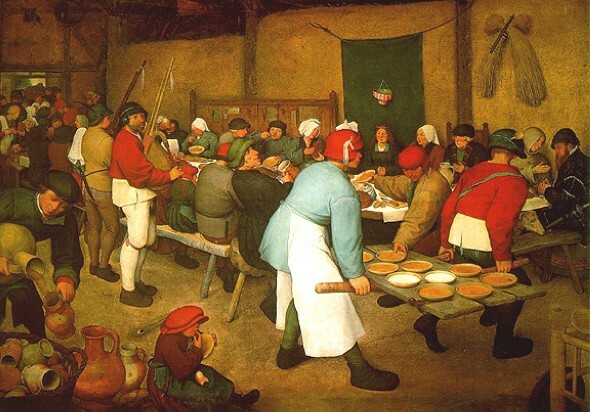 According to De Kroon he did not use any real photos of the described village party dinners but he did send us a snapshot of the painting 'Peasants Wedding' by Pieter Brueghel the Elder. Patricia Zapata is a mom, wife, graphic designer, author and an avid blogger at alittlehut.blogspot.com where she shares and explores new ideas and projects. 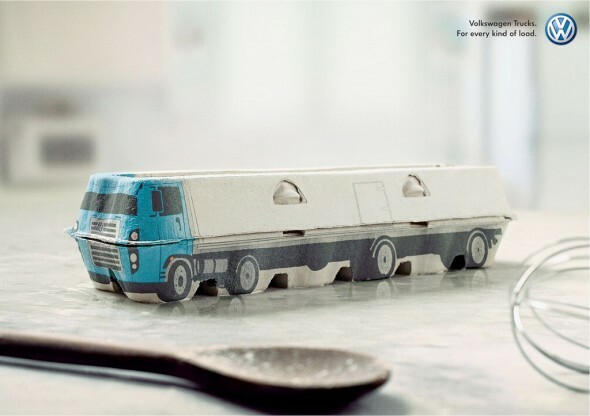 Zapata's paper craft book "Home, Paper, Scissors" will be published in August in 2009. 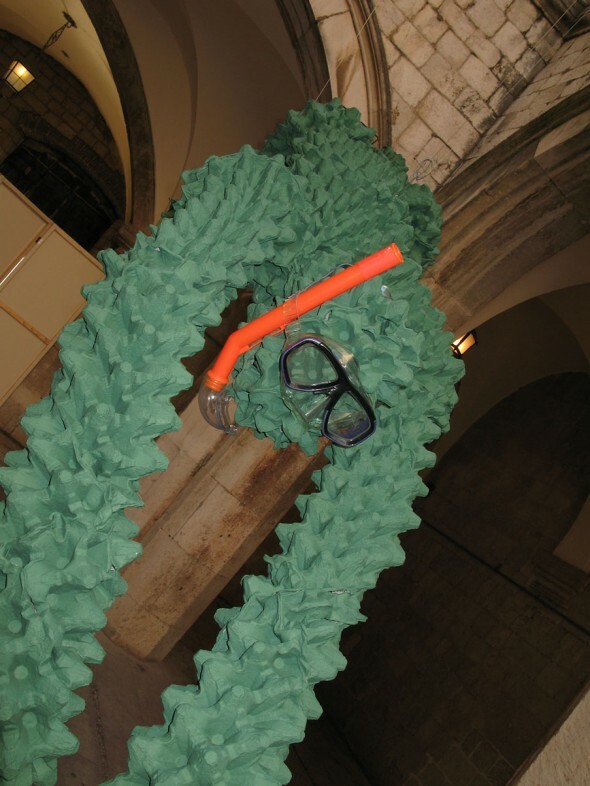 Above: Recycle project no. 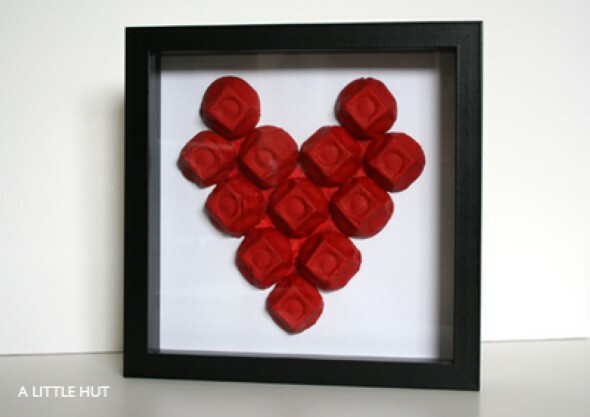 11 - egg carton turned into a heart. 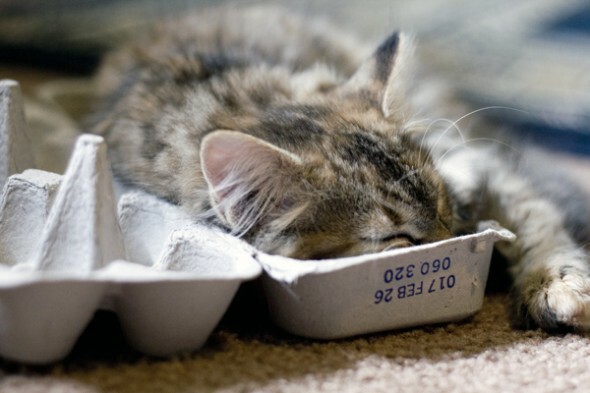 This fellow was feeling guilty for buying the blue egg carton "because it contained eggs from caged hens" which he usually does not buy. 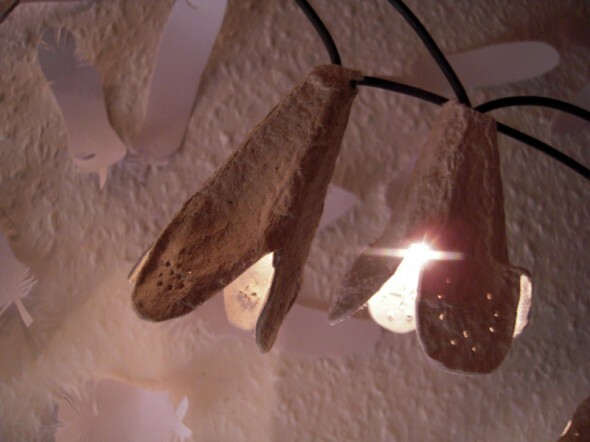 And here you can learn how to make your own egg-carton flower fairy lights. Flickred by cieraphotography this wild animal looks very much and comfortably asleep where 12 chicken eggs used to reside. We are guessing he is dreaming about the chickens. After a few days out of the box, Flickr user Kimberly Jennery was already used to finding those three clumped together in the "human bed". 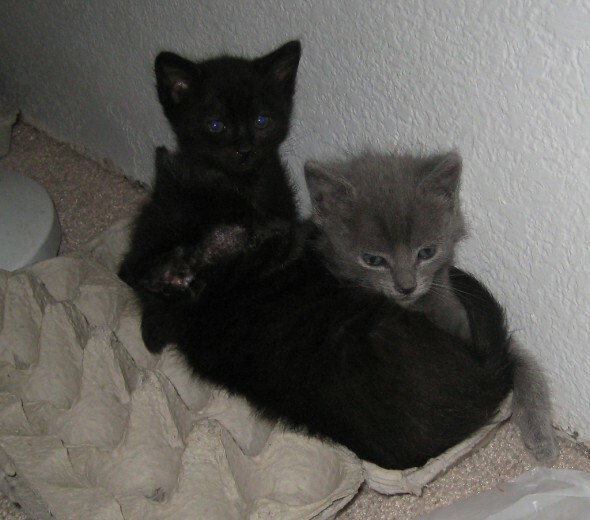 The other day she came home and found them all clumped in an egg carton. 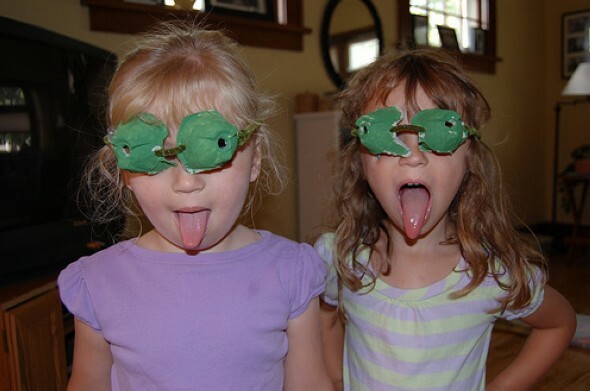 Goofies indeed. 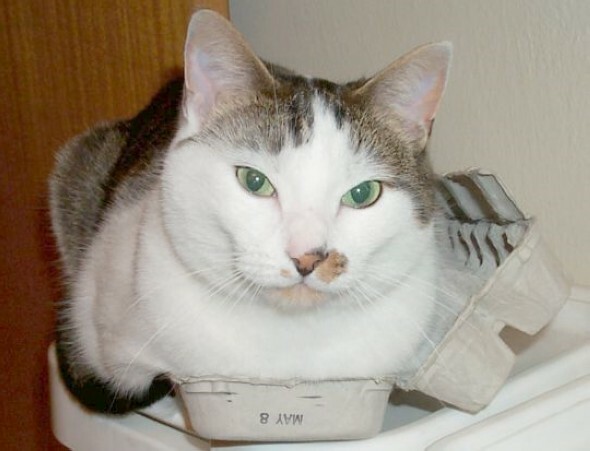 Please meet Toby, (staring) on his very own egg carton. 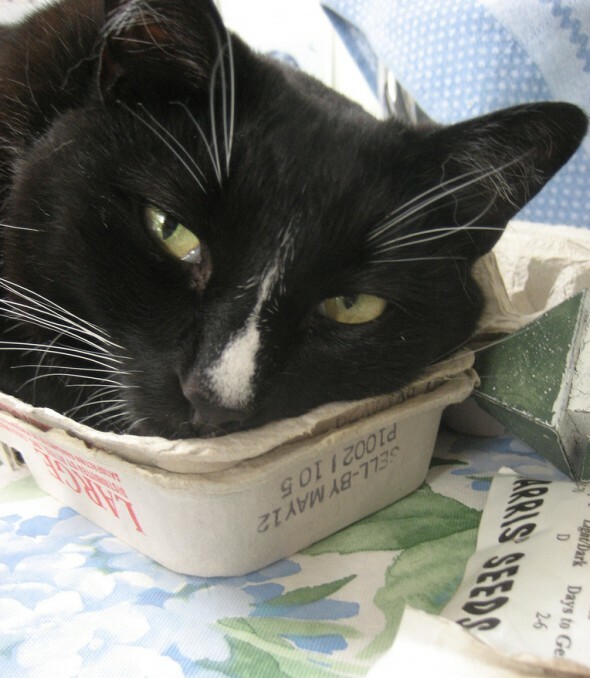 And this is Alice who think egg cartons are "irresistible, especially when they're precariously balanced atop the recycle bin". 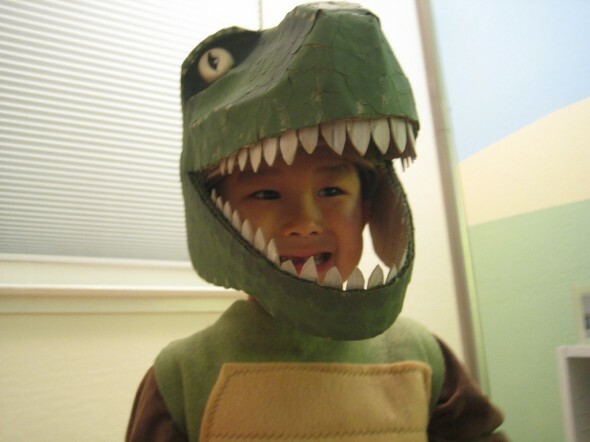 This one also has a sense for shapes. 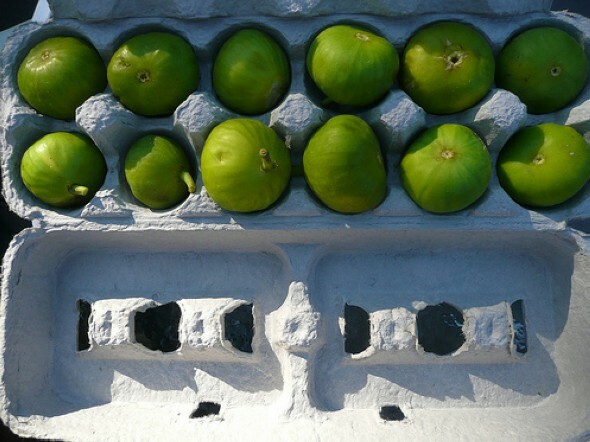 Someone gave Marilyn Blanche's mom - a genius mom - a dozen figs. We digg you Miss Blanche! 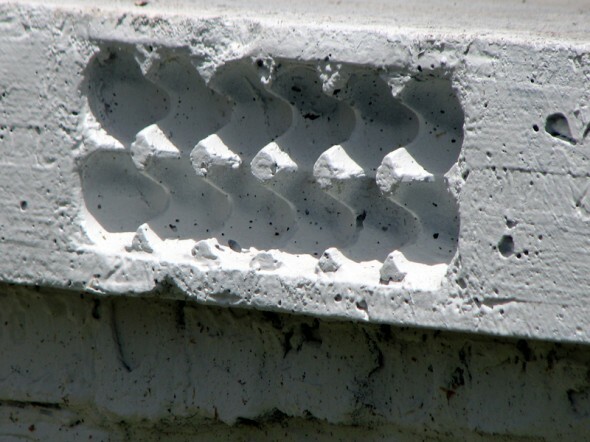 The above shanty shack concrete slabs are made with egg cartons. 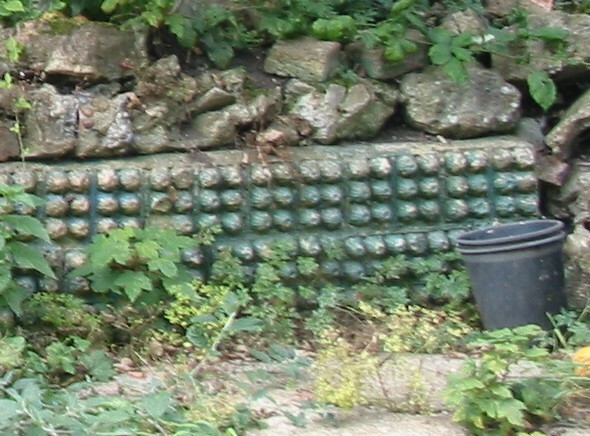 An egg carton "detail" poured into a porch slab. 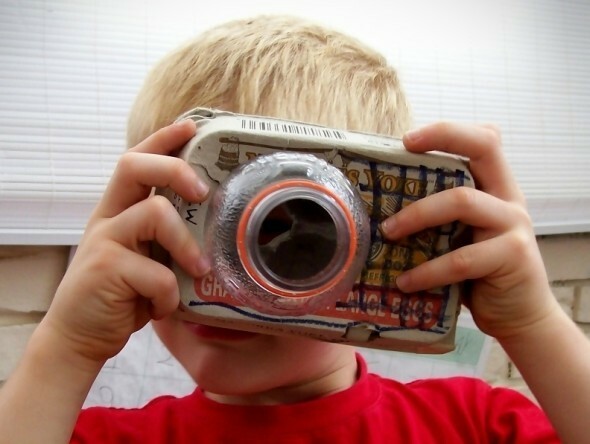 Daniel takes a picture with his creatively reused egg-carton-and-water-bottle camera. 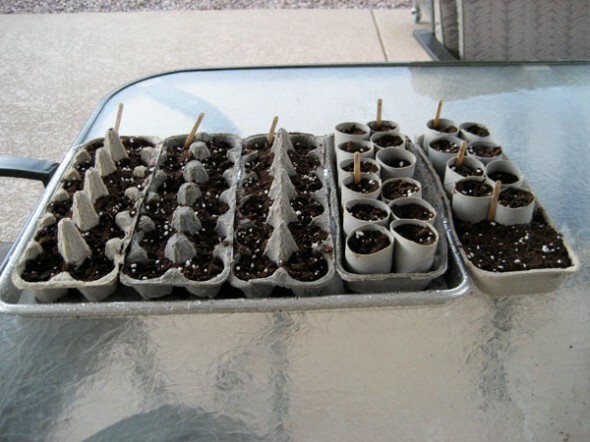 Experts say Egg cartons are not very good as sound proofing devices but this is still one of the most common ways to reuse them. 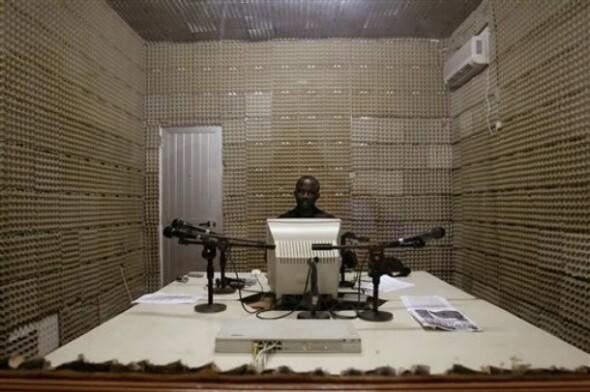 Shown above is journalist Abdourahmane Toure in a studio lined with egg cartons to improve sound quality at Radio Pindjiguiti in Bissau, Guinea-Bissau. 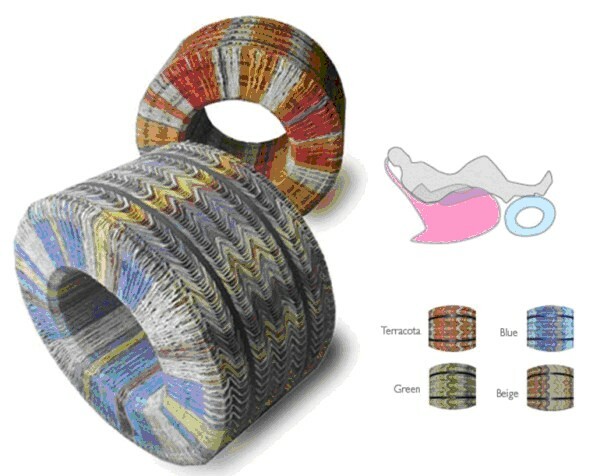 It might not work so well but admit it looks pretty cool. 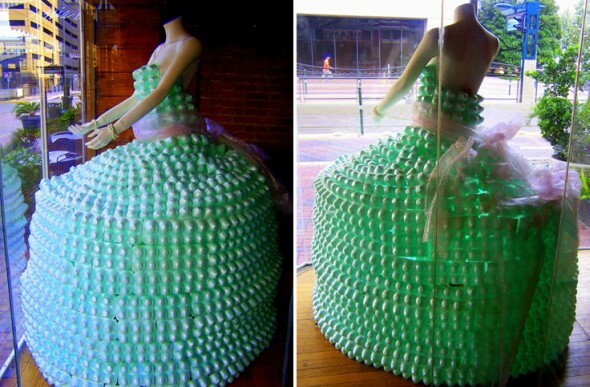 Not exactly made from the classic carton type but this nice dress was once containing eggs, that is for sure. Flickred by willowpoppy, a "Klutzy, creative, spirited British lass" from California, U.S.A, this is titled "favorite activity". 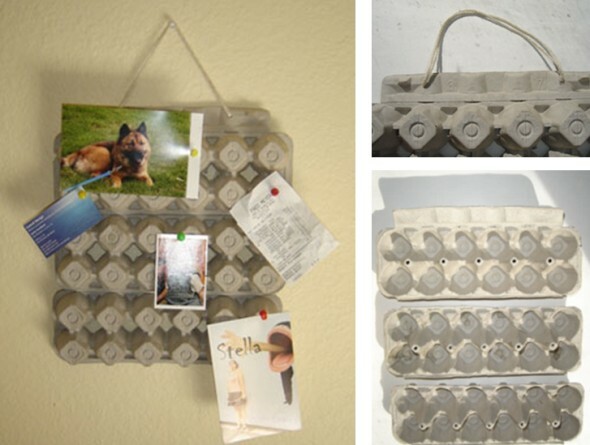 Have any photos of other cool usages for egg cartons? please let us know. 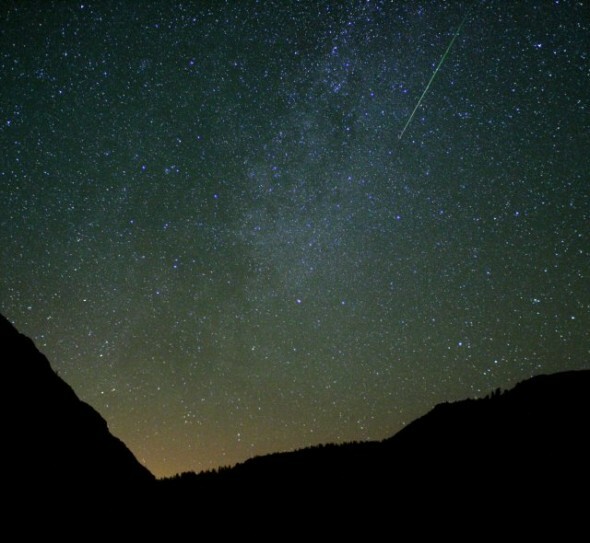 Did you know Meteor Showers recur each year, in some cases for hundreds or even thousands of years? Technically speaking, Meteor Showers are bursts of cosmic debris entering Earth's atmosphere at extremely high speed and thus vaporizing, leaving a streak of light that quickly disappears. Normally named after the constellation from which they originate these bursts are the result of interactions between a planet and a comet in which a number of meteors are observed. 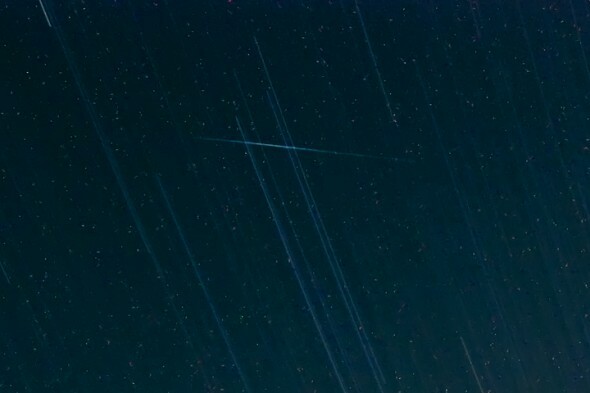 As they all travel in parallel paths and at the same velocity, to their viewer Meteor showers appear to radiate away from a single point in the sky. 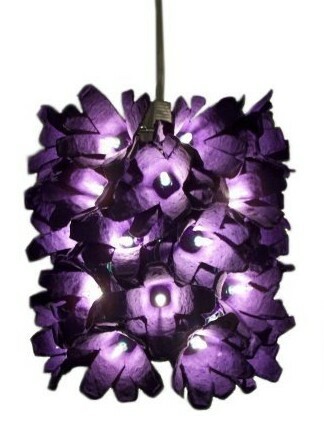 This is called the "radiant" of the shower. 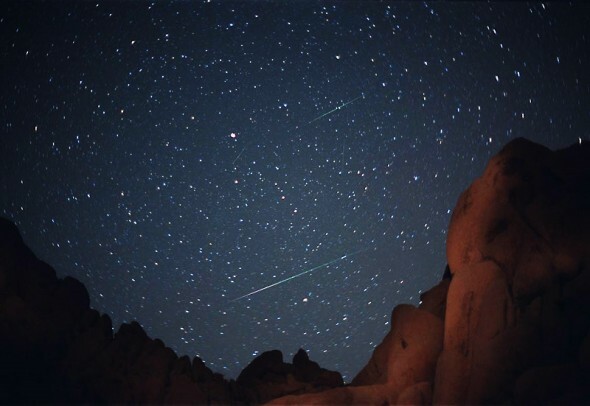 So, as we know you don't like spending your early mornings outside at the desert or up the mountains, but still love fantastic meteor showers, the following are 7 of the most prominent ones you may expect each year. We collected the most interesting snapshots for you, demonstrating how these event looked like in previous years. For full lists of Meteor showers expected this year see theskyscrapers.org or this 2009 Meteor Shower Calendar courtesy of the International Meteor Organization. 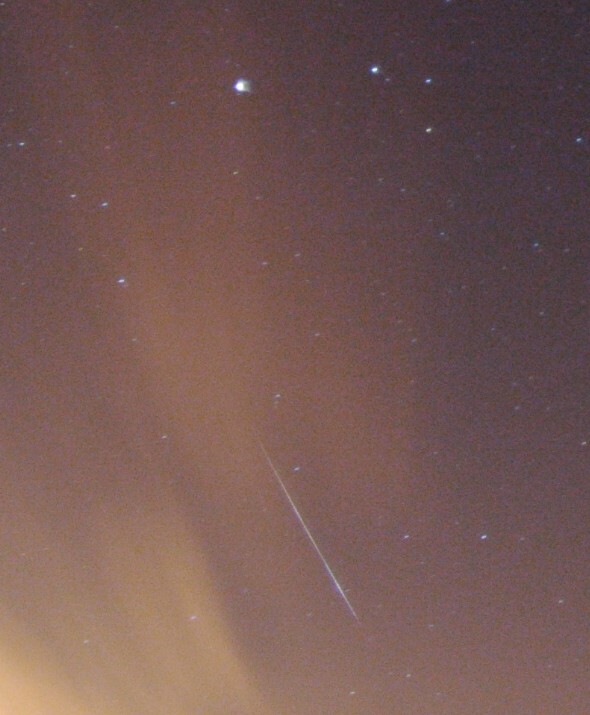 For a full list of all (or most) known Meteor showers see here. The parent body of the strong January shower of Quadrantids was recently tentatively identified as the minor planet 2003 EH1 and may be the same one which was observed by Chinese, Japanese and Korean astronomers 500 years ago. The best date to view the Quadrantids is January 3, although they can normally be viewed on any day from the 1st to the 5th of the month. The radiant rises after local midnight. 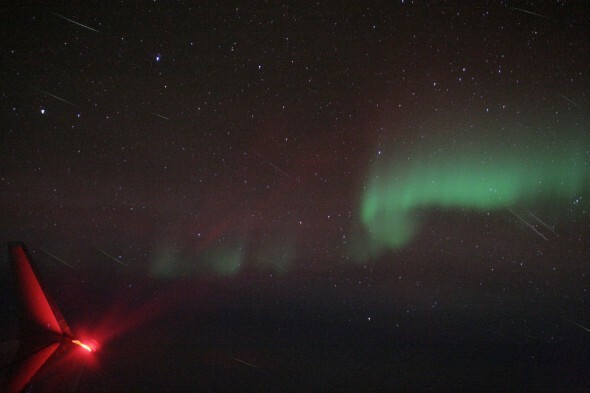 Jeremie Vaubaillon of Caltech created the above composite image of the 2008 Quadrantid shower combining short exposures of meteors and aurora seen during the returning leg of the Quadrantid MAC mission. 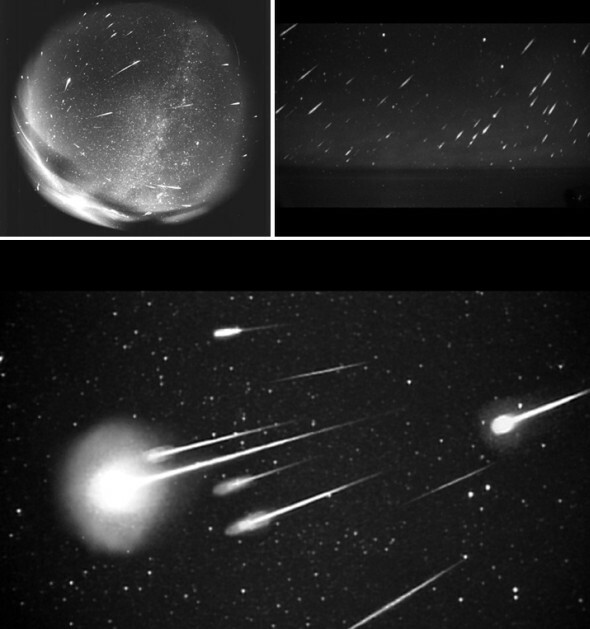 The Lyrids are a strong meteor shower lasting from April 16 to April 26 each year and resulting from a periodic Comet named C/1861 G1 Thatcher. 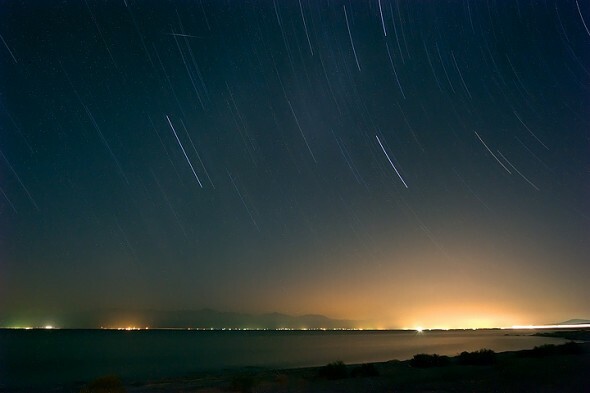 The Lyrids showers are well known for the past 2600 years. Titled 4 Meteors in 4 Minutes the above 4 minute exposure image of the northern sky by Wally Pacholka includes two Lyrid meteors in addition to two sporadic ones. 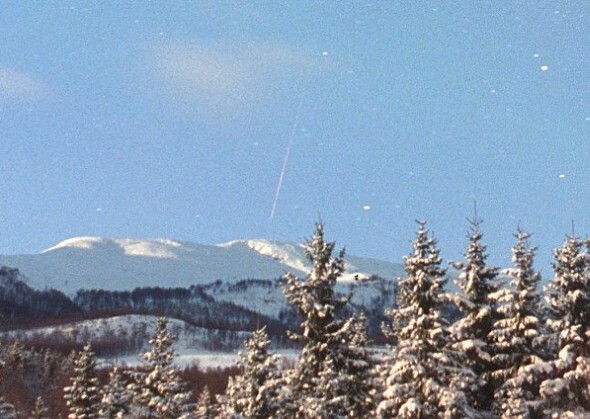 The photo was taken during the peak of the Lyrid Meteor Shower on the morning of April 22, 2003. 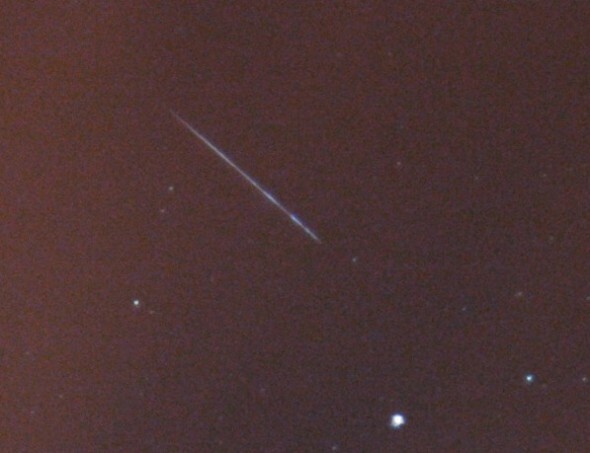 The two Lyrid meteors can be distinguished as the parallel streaks pointing back to the constellation Lyra. 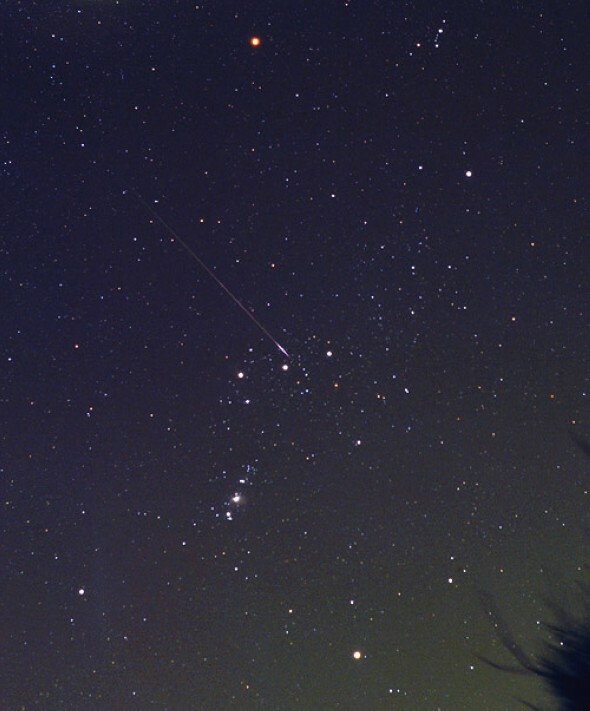 Though you can expect only 15 meteors per hour at best under dark sky conditions, the Capricornids are noted for producing brilliant fireballs. Today astronomers generally seem to agree that two or three distinct maximums occur during the time the Alpha Capricornids are active. The shower is created from the debris in the meteor stream, which becomes visible on the earth when the earth passes through the stream. Astronomers have not identified the object responsible for producing the Alpha Capricornids. Yet, the discovery of this meteor shower is attributed to a very cool Hungarian astronomer named Miklós von Konkoly Thege, who first plotted several meteors emanating from the region of the star Alpha Capricorni on the nights of July 28 and 29, 1871! The above photo was taken by Zhong on the night of July 29, 2008. The meteor on the top of the photo has been processed to make more visible. See a few more from Zhong below. Named after the radiant they appear from - Perseus - the Perseids is a meteor shower associated with the comet Swift-Tuttle. Most of nowadays Perseids dust cloud is estimated to be about a thousand years old but some of it boiled off the comet in 1862. 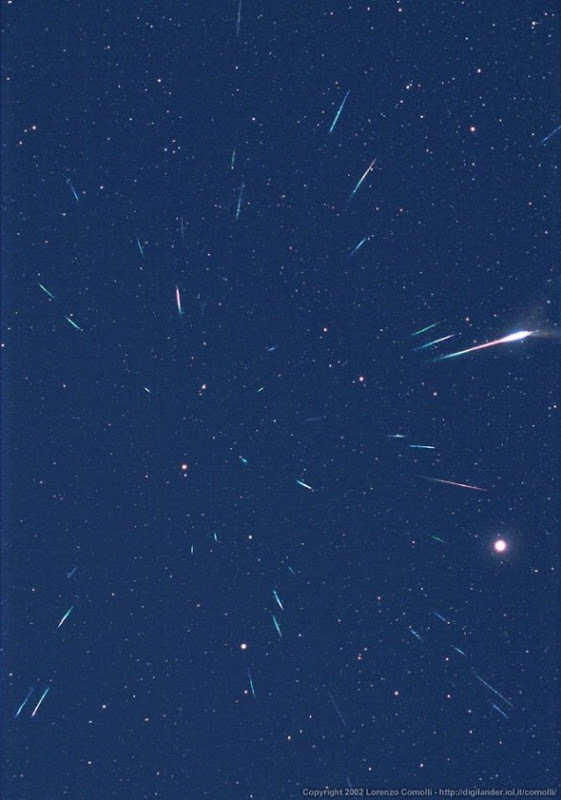 Luckily for us who like meteor showers, the rate of meteors originating from these parts is much higher than for the older part of the stream. 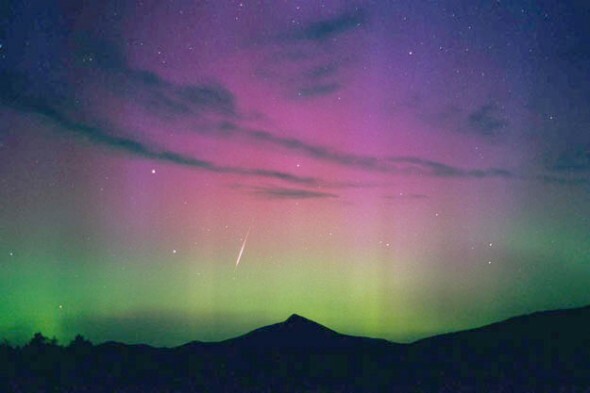 Above: the night sky Aurora of Perseids, taken by Enest in Colorado on the night of August 21, 2000. These annual meteor showers occur at and are named after their radiant which is located between the Orion and Gemini constellations. 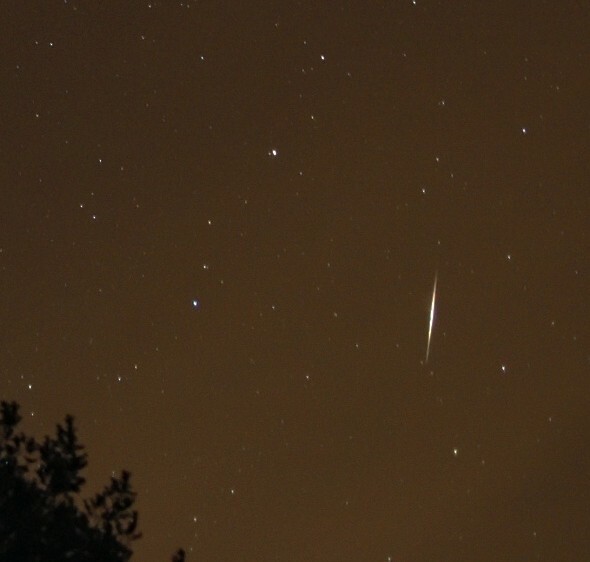 Orionid meteor showers peak around October 21 and normally include 16-30 meteors per hour. 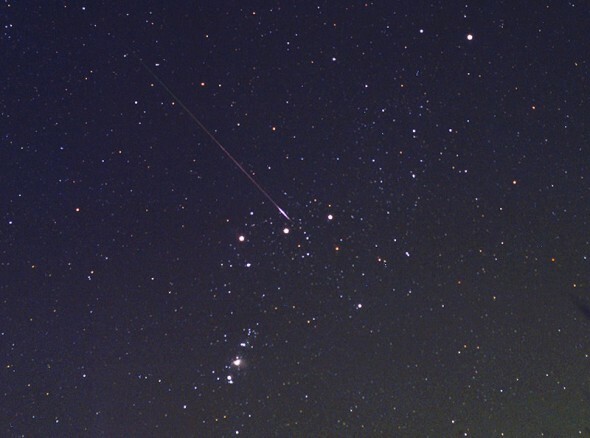 The Orionid meteor showers are caused by one of the most well known comets - Halley. 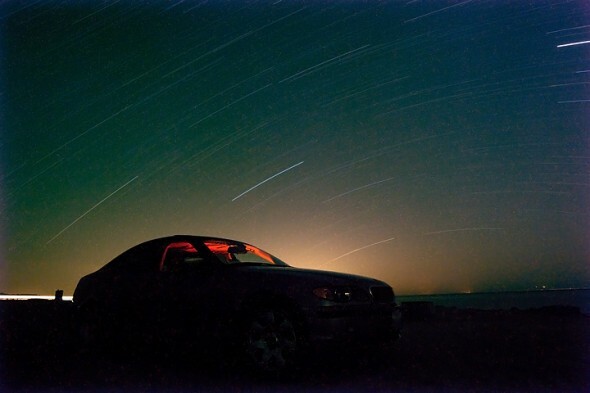 Above: 10 seconds exposure photograph of a meteor streak from the Orionids shower, shot by midendian on October 21, 2006 from Blue Canyon, Highway 108 near Sonora Pass, Sierra Nevada, California. 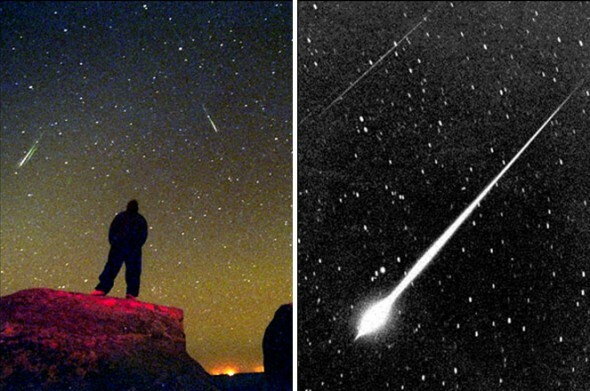 The top image in the above combination image was recorded on the 21, 22 and 23 of October 2006 by Steve Quirks of the Frog Rock Observatory cyber-space, a privately owned astronomical observatory located outside of Mudgee, NSW, Australia. It shows about 240 Orionid meteors with the Pleiades ones seen right of the image centre. The meteors are from the debris left in Comet Halley's orbit. 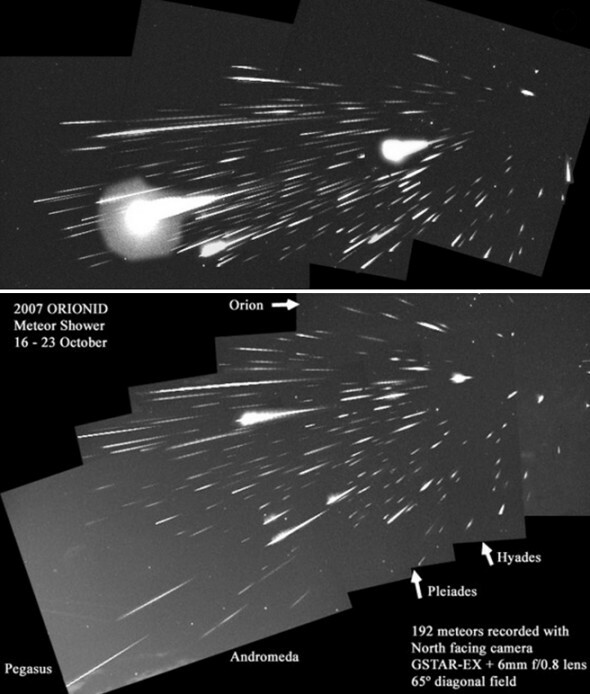 The lower combination image above was recorded by Quirks on the 16th to the 23rd of October 2007 and shows 192 Orionid meteors. Named after the location of their radiant in the constellation Leo, The Leonids occur every year on or about November 18, resulting from the comet Tempel-Tuttle. 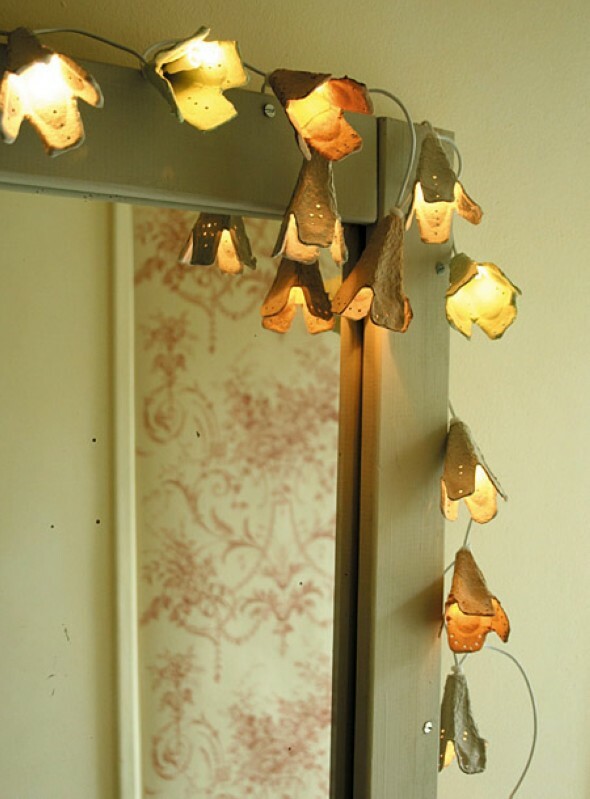 This shower is widely considered to be among the most spectacular of all meteor showers. 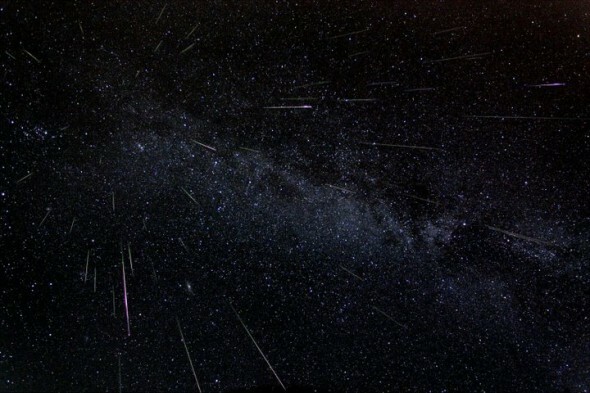 A great Leonids storm in 1833 have had a major effect on the development of the scientific meteor study which had previously been mistakenly thought to be an "atmospheric phenomena". 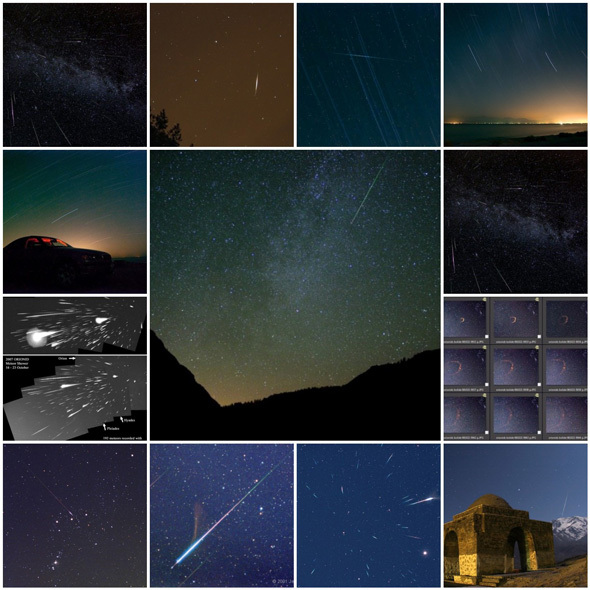 Top left: The peak of the 1998 Leonid meteor shower shown in a four-hour time exposure through a fisheye lens as taken by Juraj Toth of Modra Observatory. 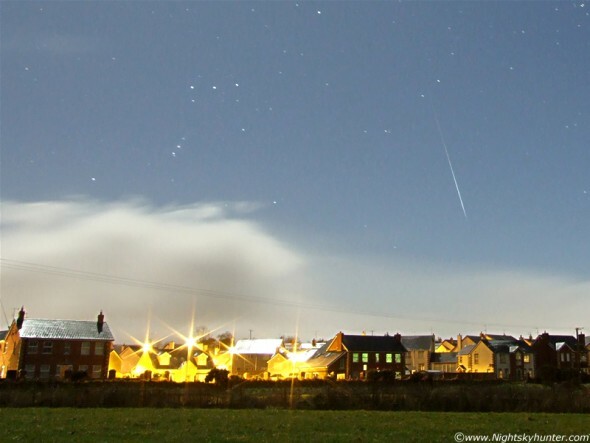 This photograph demonstrates how the meteors in a particular shower appear to emanate from a certain point in the sky (radiant). The two other images above were taken by Shinsuke Abe and Hajime Yano of ISAS during the 1999 Leonid storm. 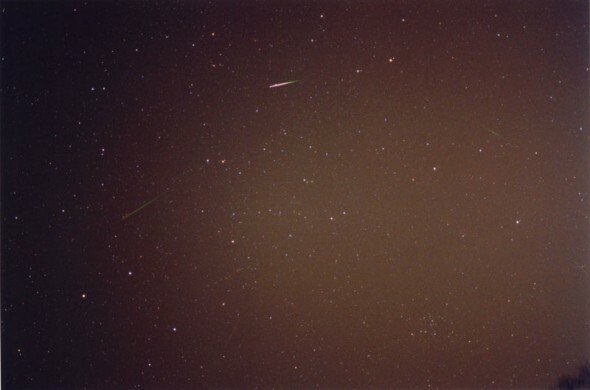 Above: 3 Leonid Meteor Shower shots taken by Lauri A. Kangas on the night of November 18, 2001. Those are 2-5 minute exposures using a Nikon F2, 35mm, 28mm and 50mm lenses, a Fuji Superia X-tra 800 Film and an equatorial mount. Taken by Jerry Lodriguss also during the great Leonid meteor storm of November 18, 2001, and selected as the Astronomy Picture of the Day (November 22, 2001), the fabulous masterpiece above shows a clear view of three Leonid meteors streaking through the constellation of Orion into Eridanus. 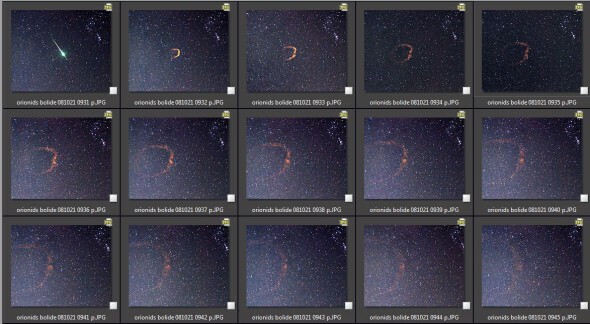 According to Lodriguss, the fantastic colors you can see in the meteor's path come from different emissions as the meteor burns up and interacts with molecules in the upper atmosphere. After the meteor disappeared "a persistent train was left behind which appears as a twisting smoke trail to the left of the meteor". 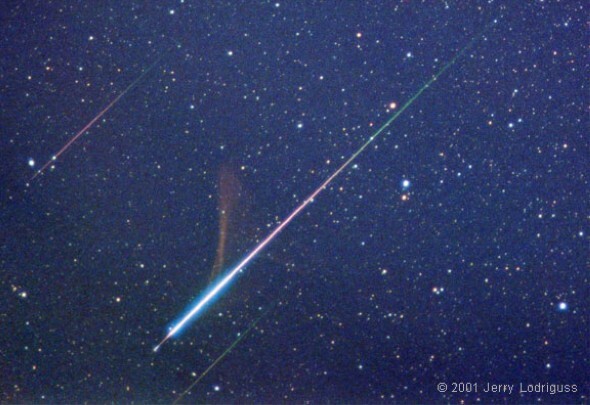 Unlike Perseids and Leonids mentioned above, the Geminids were observed for the first time only about 150 years ago. Considering the fact they are caused by something that does not even exists any more - an extinct comet named 3200 Phaethon - the Geminids are perhaps the most amazing and spectacular of all Meteor showers and are definitely our favorite one. To get a look at those beauties you'd have to hold your breath until mid-December as they usually peak around 12-14 of the month. 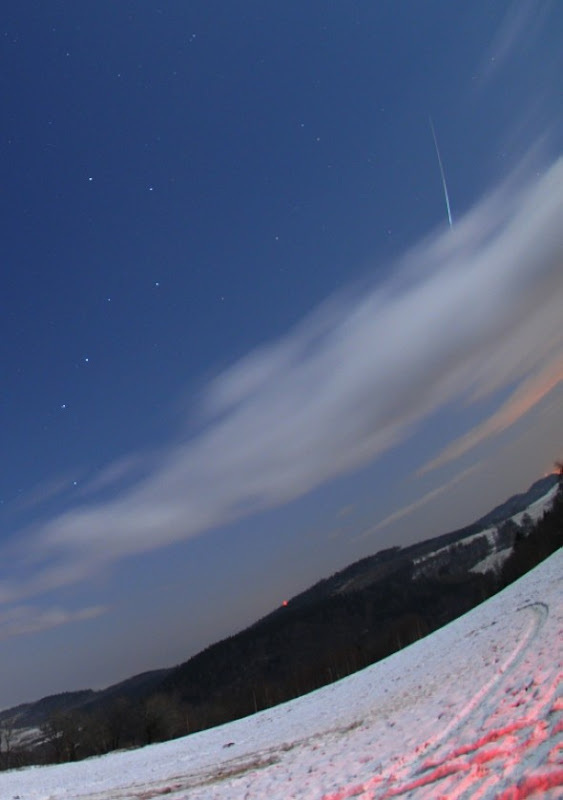 The Geminid is the most reliable meteor shower and intensifies every year: recent showers were reported to include 120-160 visible meteors per hour under optimal conditions. 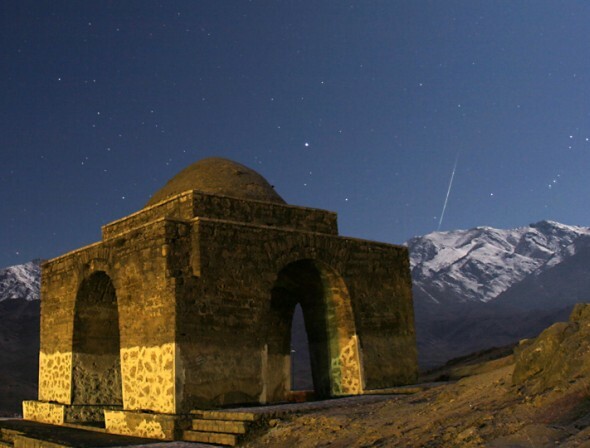 The above photograph (detail) was taken from the ancient fire temple of Zorostrian in Niasar, Iran by Babak Tafreshi. It was shot just a few weeks ago on December 14, 2008. Lastly, check on the above shot taken on December 14, 2008 by an amateur radio astronomer named Thomas Ashcraft, who operates a dual radio-optical meteor monitoring system in New Mexico, USA. 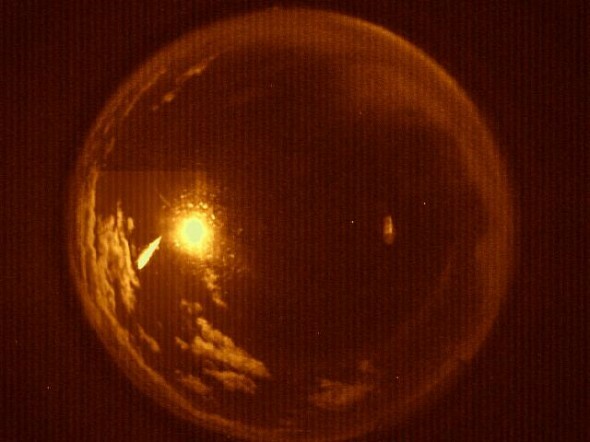 A special "all-sky" video camera operated by Ashcraft records fireballs as they streak overhead. An antenna array records the reflections of distant radio stations from the meteor's ionized trail.